Contains extra folic acid. Suitable for vegetarians. Halal - HFA approved. Kosher. Special K flakes are a delicious combination of crunchy rice, whole wheat and barley. A nutritious cereal with fibre and wholegrain and 9 key vitamins and minerals. Feed your strength with Special K, a nutritious and delicious start to your day*. 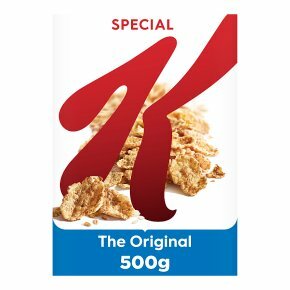 *Special K cereals & cereal bars (excluding Biscuit Moments) contain ? 15% of the nutrient reference value of vitamins B3, B6 and B9 which contribute to the reduction of tiredness and fatigue. Enjoy as part of a varied and balanced diet and a healthy lifestyle.